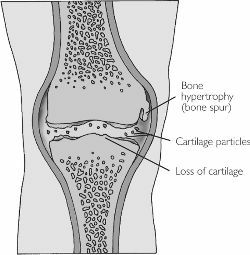 Osteoarthritis (OA), which is also known as osteoarthrosis or degenerative joint disease (DJD), is a progressive disorder of the joints caused by gradual loss of cartilage and resulting in the development of bony spurs and cysts at the margins of the joints. The name osteoarthritis comes from three Greek words meaning bone, joint, and inflammation. OA is one of the most common causes of disability due to limitations of joint movement, particularly in people over 50. It is estimated that 2% of the United States population under the age of 45 suffers from osteoarthritis; this figure rises to 30% of persons between 45 and 64, and 63-85% in those over 65. About 90% of the American population will have some features of OA in their weight-bearing joints by age 40. Men tend to develop OA at earlier ages than women. OA occurs most commonly after 40 years of age and typically develops gradually over a period of years. Patients with OA may have joint pain on only one side of the body and it primarily affects the knees, hands, hips, feet, and spine. Osteoarthritis results from deterioration or loss of the cartilage that acts as a protective cushion between bones, particularly in weight-bearing joints such as the knees and hips. As the cartilage is worn away, the bone forms spurs, areas of abnormal hardening, and fluid-filled pockets in the marrow known as subchondral cysts. As the disorder progresses, pain results from deformation of the bones and fluid accumulation in the joints. The pain is relieved by rest and made worse by moving the joint or placing weight on it. In early OA, the pain is minor and may take the form of mild stiffness in the morning. In the later stages of OA, inflammation develops; the patient may experience pain even when the joint is not being used; and he or she may suffer permanent loss of the normal range of motion in that joint. Until the late 1980s, OA was regarded as an inevitable part of aging, caused by simple "wear and tear" on the joints. This view has been replaced by recent research into cartilage formation. OA is now considered to be the end result of several different factors contributing to cartilage damage, and is classified as either primary or secondary. Primary OA results from abnormal stresses on weight-bearing joints or normal stresses operating on weakened joints. Primary OA most frequently affects the finger joints, the hips and knees, the cervical and lumbar spine, and the big toe. The enlargements of the finger joints that occur in OA are referred to as Heberden's and Bouchard's nodes. Some gene mutations appear to be associated with OA. Obesity also increases the pressure on the weight-bearing joints of the body. Finally, as the body ages, there is a reduction in the ability of cartilage to repair itself. In addition to these factors, some researchers have theorized that primary OA may be triggered by enzyme disturbances, bone disease, or liver dysfunction. The two most important diagnostic clues in the patient's history are the pattern of joint involvement and the presence or absence of fever, rash, or other symptoms outside the joints. As part of the physical examination, the doctor will touch and move the patient's joint to evaluate swelling, limitations on the range of motion, pain on movement, and crepitus (a cracking or grinding sound heard during joint movement). There is no laboratory test that is specific for osteoarthritis. Treatment is usually based on the results of diagnostic imaging. In patients with OA, x-rays may indicate narrowed joint spaces, abnormal density of the bone, and the presence of subchondral cysts or bone spurs. The patient's symptoms, however, do not always correlate with x-ray findings. Magnetic resonance imaging (MRI) and computed tomography scans (CT scans) can be used to determine more precisely the location and extent of cartilage damage. Treatment of OA patients is tailored to the needs of each individual. Patients vary widely in the location of the joints involved, the rate of progression, the severity of symptoms, the degree of disability, and responses to specific forms of treatment. Most treatment programs include several forms of therapy. Patient education is an important part of OA treatment because of the highly individual nature of the disorder and its potential impacts on the patient's life. Patients who are depressed because of changes in employment or recreation usually benefit from counseling. The patient's family should be involved in discussions of coping, household reorganization, and other aspects of the patient's disease and treatment regimen. Patients with mild OA may be treated only with pain relievers such as acetaminophen (Tylenol). Most patients with OA, however, are given nonsteroidal anti-inflammatory drugs, or NSAIDs. These include compounds such as ibuprofen (Motrin, Advil), ketoprofen (Orudis), and flurbiprofen (Ansaid). The NSAIDs have the advantage of relieving inflammation as well as pain. They also have potentially dangerous side effects, including stomach ulcers, sensitivity to sun exposure, kidney disturbances, and nervousness or depression. Some OA patients are treated with corticosteroids injected directly into the joints to reduce inflammation and slow the development of Heberden's nodes. Injections should not be regarded as a first-choice treatment and should be given only two or three times a year. Most recently, a new class of NSAIDs, known as the cyclo-oxygenase-2 (COX-2) inhibitors have been studied and approved for the treatment of OA. These COX-2 inhibitors work to block the enzyme COX-2, which stimulates inflammatory responses in the body. They work to decrease both the inflammation and joint pain of OA, but without the high risk of gastrointestinal ulcers and bleeding seen with the traditional NSAIDs. This is due to the fact that they do not block COX-1, which is another enzyme that has protective effects on the stomach lining. The COX-2 inhibitors included celecoxib (Celebrex) and rofecoxib (Vioxx). Celecoxib is taken once or twice daily, and rofecoxib once daily. are recommended for OA patients. These may include walking, swimming and other water exercises, yoga and other stretching exercises, or isometric exercises. Physical therapy may also include massage, moist hot packs, or soaking in a hot tub. Surgical treatment of osteoarthritis may include the replacement of a damaged joint with an artificial part or appliance; surgical fusion of spinal bones; scraping or removal of damaged bone from the joint; or the removal of a piece of bone in order to realign the bone. Depending on the location of the affected joint, patients with OA may be advised to use neck braces or collars, crutches, canes, hip braces, knee supports, bed boards, or elevated chair and toilet seats. They are also advised to avoid unnecessary knee bending, stair climbing, or lifting of heavy objects. Disease-modifying drugs. These compounds may be useful in assisting the body to form new cartilage or improve its repair of existing cartilage. Hyaluronic acid. Injections of this substance may help to lubricate and protect cartilage, thereby promoting flexibility and reduced pain. These agents include hyaluronan (Hyalgan) and hylan G-F20 (Synvisc). Cartilage transplantation. This technique is presently used in Sweden. Food intolerance can be a contributing factor in OA, although this is more significant in rheumatoid arthritis. Dietary suggestions that may be helpful for people with OA include emphasizing high-fiber, complex-carbohydrate foods, while minimizing fats. Plants in the Solanaceae family, such as tomatoes, eggplant, and potatoes, should be avoided, as should refined and processed foods. Foods that are high in bioflavonoids (berries as well as red, orange, and purple fruits and vegetables) should be eaten often. In the past several years, a combination of glucosamine and chondroitin sulfate has been proposed as a dietary supplement that helps the body maintain and repair cartilage. Studies conducted in Europe have shown the effectiveness of this treatment in many cases. These substances are nontoxic and do not require prescriptions. Other supplements that may be helpful in the treatment of OA include the antioxidant vitamins and minerals (vitamins A, C, E, selenium, and zinc) and the B vitamins, especially vitamins B6 and B5. Naturopathic treatment for OA includes hydrotherapy, diathermy (deep-heat therapy), nutritional supplements, and botanical preparations, including yucca, devil's claw (Harpagophytum procumbens), and hawthorn (Crataegus laevigata) berries. Practitioners of Chinese medicine treat arthritis with suction cups, massage, moxibustion (warming an area of skin by burning a herbal wick a slight distance above the skin), the application of herbal poultices, and internal doses of Chinese herbal formulas. OA is a progressive disorder without a permanent cure. In some patients, the rate of progression can be slowed by weight loss, appropriate exercise, surgical treatment, and the use of alternative therapies. Bouchard's nodes — Swelling of the middle joint of the finger. 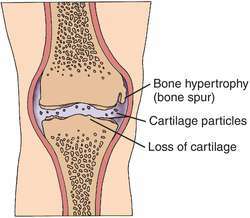 Cartilage — Elastic connective tissue that covers and protects the ends of bones. Heberden's nodes — Swelling or deformation of the finger joints closest to the fingertips. Primary osteoarthritis — OA that results from hereditary factors or stresses on weight-bearing joints. Secondary osteoarthritis — OA that develops following joint surgery, trauma, or repetitive joint injury. Subchondral cysts — Fluid-filled sacs that form inside the marrow at the ends of bones as part of the development of OA. Berger, R. G. "Intelligent Use of NSAIDs: Where Do We Stand." Expert Opinions in Pharmacotherapy 1, no. 2 (January 2001): 19-30. Brandt, K. D. "The Role of Analgesics in the Management of Osteoarthritis." American Journal of Therapeutics March 2000: 75-90. Little, C. V., and T. Parsons. "Herbal Therapy for Treating Osteoarthritis." Cochrane Database System Review 2001: 1. Pavelka, K. "Treatment of Pain in Osteoarthritis." European Journal of Pain 2000: 23-30. Schnitzer, T. J. "Osteoarthritis Management: The Role of Cyclooxygenase-2-selective Inhibitors." Clinical Therapeutics March 2001: 313-26. Towheed, T. E., et al. "Glucosamine Therapy for Treating Osteoarthritis." Cochrane Database System Review 2001: 1.
a noninflammatory degenerative joint disease marked by degeneration of the articular cartilage, hypertrophy of bone at the margins, and changes in the synovial membrane. Primary osteoarthritis, as part of the normal aging process, is most likely to strike the joints that receive the most use or stress over the years. These include the knees, the joints of the big toes, and those of the lower part of the spine. Another common form of osteoarthritis affects the distal joints of the fingers; this form usually occurs in women. Called also degenerative joint disease. Symptoms vary from mild to severe, depending on the amount of degeneration that has taken place. 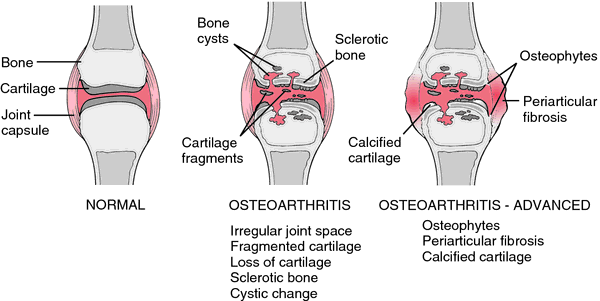 Osteoarthritis is caused by disintegration of the cartilage that covers the ends of the bones. As the cartilage wears away, the roughened surface of the bone is exposed, and pain and stiffness result. In severe cases the center of the bone wears away and a bony ridge is left around the edges. This ridge may restrict movement of the joint. Osteoarthritis is less crippling than rheumatoid arthritis, in which two bone surfaces may fuse, completely immobilizing the joint. Treatment is aimed at preventing crippling deformities, relieving pain, and maintaining motion of the joint; see also treatment of arthritis. Osteoarthritis. Schematic presentation of the pathologic changes in osteoarthritis. Fragmentation and loss of cartilage denude the subchondral bone, which undergoes sclerosis and cystic change. Osteophytes form on the lateral sides and protrude into the adjacent soft tissues, causing irritation, inflammation, and fibrosis. From Damjanov, 2000. (os'tē-ō-ar-thrī'tis), [MIM*165720] This word is a misnomer in that the dominant pathologic process is degeneration rather than inflammation. 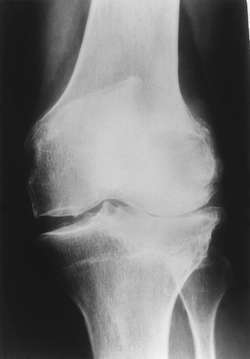 Arthritis characterized by erosion of articular cartilage, either primary or secondary to trauma or other conditions, which becomes soft, frayed, and thinned with eburnation of subchondral bone and outgrowths of marginal osteophytes; pain and loss of function result; mainly affects weight-bearing joints, is more common in old people and animals. A chronic disease characterized by progressive degeneration of the cartilage of the joints, occurring mainly in older persons. Also called degenerative joint disease. a form of arthritis in which one or many joints undergo degenerative changes, including subchondral bony sclerosis, loss of articular cartilage, and proliferation of bone spurs (osteophytes) and cartilage in the joint. Inflammation of the synovial membrane of the joint is common late in the disease. Osteoarthritis is the most common form of arthritis. Its cause is unknown but may include chemical, mechanical, genetic, metabolic, and endocrine factors. Emotional stress often aggravates the condition. The disease usually begins with pain after exercise or use of the joint. Stiffness, tenderness to the touch, crepitus, and enlargement develop. Deformity, incomplete dislocation, and synovial effusion may eventually occur. Involvement of the hip, knee, or spine causes more disability than osteoarthritis of other areas. Treatment includes rest of the involved joints; use of a cane, a walker, or crutches to decrease weight-bearing; heat; and antiinflammatory drugs. Overweight patients may be advised to lose weight. Systemic corticosteroids are contraindicated, but intraarticular injections of corticosteroids may give relief. Surgical treatment is sometimes necessary and may reduce pain and greatly improve the function of a joint. Hip replacement, joint debridement, fusion, and decompression laminectomy are some of the surgical procedures used in treating advanced osteoarthritis. Compare rheumatoid arthritis. Also called degenerative joint disease. observations Early symptoms include deep, aching joint pain that is aggravated by exercise and that worsens as the day progresses. Inactivity contributes to stiffness. Midcourse of the disease is marked by reduced joint motion, tenderness, crepitus, grating sensation, flexion contractures, and joint enlargement. Manifestations late in the disease include tenderness on palpation, pain with passive ROM, increase in degree and duration of pain, joint deformity, and subluxation. Diagnosis is made by using clinical exam, with presence of usual manifestations plus possible Heberden's or Bouchard's nodules of the finger joints. Gait analysis may reveal altered motion patterns. Radiology may reveal narrowed joint space, increased density of subchondral bone, pseudocysts in subchondral marrow, and/or osteophytes at joint periphery. Analysis of synovial fluid typically shows high viscosity fluid that is yellow or transparent in color. Cultures of fluid are negative; WBC count is 200 to 2000/μL, with less than 25 polymorphonuclear leukocytes. Osteoarthritis of the spine can cause compression of the spinal cord, leading to weakness in the extremities, incontinence of bowel and bladder, and impotence. interventions Treatment is aimed at pain reduction, slowing the degenerative process, and increasing joint mobility. Oral analgesics are used for pain; NSAIDs are used for inflammation; muscle relaxants and intraarticular steroid injections provide some transient relief. Topical agents (capsaicin) may provide temporary pain relief. Dietary supplements glucosamine and chondroitin sulfate are used for pain relief and improving joint mobility. Arthroscopy, osteotomy, laminectomy, fusion, and/or total joint replacement may be considered if conservative therapy fails. nursing considerations Nursing goals include pain management, maintenance of joint function, and increasing activity tolerance and maintaining independence in self-care activities. Pain management makes use of a combination of pharmacological (analgesics, muscle relaxants, and steroids) and nonpharmacological (moist heat, massage, and rest) methods. Joint function is maintained by a judicious balance of rest and activity and use of a regular exercise program (isometric, isotonic, isokinetic, strengthening, stretching, ROM, and balance exercises). Joint protection measures, such as losing weight to reduce joint load, using assistive devices to aid mobility, avoiding forceful or repetitive movement, using good body mechanics and erect posture, and developing pacing techniques for daily routines can improve activity tolerance. Joint stability can be enhanced by actions such as avoiding soft chairs, using recliners, and placing pillows under knees; wearing sturdy, low-heeled shoes; removing environmental hazards; and using mobility aids and joint support devices. Decreasing pain and increasing joint flexibility lead to prolonged ability to perform activities of daily living. Degenerative arthritis, degenerative joint disease, hypertrophic osteoarthritis, noninflammatory arthritis, osteoarthrosis wear-and-tear arthritis Orthopedics The most common type of arthritis characterized by inflammation, degeneration and eventual loss of the cartilage of the joints of finger, hands, feet, spine, and large weight-bearing joints–eg, hips and knees, local pain, without systemic disease Etiology Unknown; aging, metabolic, genetic, chemical, mechanical factors may play a role. See Cervical osteoarthritis. Cf Rheumatoid arthritis. 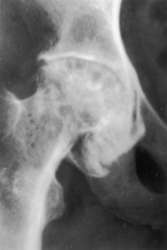 Arthritis characterized by erosion of articular cartilage, which becomes soft, frayed, and thinned with eburnation of subchondral bone and outgrowths of marginal osteophytes; pain and loss of function result; mainly affects weight-bearing joints, is more common in women, the overweight, and in older people. Synonym(s): degenerative joint disease, hypertrophic arthritis, osteoarthrosis. Treatment is supportive, using exercise balanced with rest and locally applied heat. Weight reduction, if needed, can ease joint pain and improve mobility; a body mass index below 24.9 is desirable. Aerobic exercise and flexibility routines can prevent joint stiffness related to lack of movement, and strong muscles provide better joint support. Swimming and aquatic exercises, which improve aerobic fitness without stressing joints, are encouraged. Meditation and other forms of relaxation may be beneficial as part of the patient's daily routine. Analgesics provide pain relief. Acetaminophen is the drug of choice, unless contraindicated. Nonsteroidal anti-inflammatory drugs (NSAIDs) are good alternatives for pain that is unresponsive to acetaminophen, although these agents increase the risk of gastrointestinal injury, bleeding, and renal failure. Other useful drugs include low doses of narcotic pain relievers, steroids, and intra-articular injections. Some patients, esp. those with osteoarthritis of the knee, benefit from joint bracing. If degeneration reaches the point where a joint is “bone on bone, ” joint replacement surgery usually is recommended, providing greatly improved mobility and function as well as pain relief. A common form of persistent degenerative joint disease involving damage to the cartilaginous bearing surfaces and sometimes widening or remodelling of the ends of the bones involved in the joint. RHEUMATOID FACTOR is not present in the blood. Osteoarthritis is an age-related condition and affects especially those joints that have previously been damaged. Arthritis characterized by erosion of articular cartilage, either primary or secondary to trauma or other conditions, which becomes soft, frayed, and thinned with eburnation of subchondral bone and outgrowths of marginal osteophytes; pain and loss of function result. a noninflammatory degenerative joint disease marked by degeneration of the articular cartilage, hypertrophy of bone at the margins, and changes in the synovial membrane; called also degenerative joint disease. There is chronic lameness, bulls are reluctant to serve, the gait is stiff, the animals are reluctant to rise and have difficulty doing so. The affected limb shows atrophy, the joint is painful on passive movement and may show crepitus. In pigs epiphysiolysis may occur. See also osteochondrosis, leg weakness of pigs. result of repeated injury to joint surfaces, ligaments and cartilages of serving bulls. in cattle the coxofemoral joint is most affected in Herefords, the stifle in Holstein-Friesian and Angus. In horses the coxofemoral joint is affected. Q. What are the complications of osteoarthritis? I have been suffering from osteoarthritis for over a year now. What are the complications of this disease? A. Osteoarthritis, as other chronic arthritic diseases, has a very debilitating influence, due to the great pain people often suffer from. It sometimes becomes impossible to walk or stand up, and thus it lead to less movement, weight gain, development of blood clots and venous stasis. The emotional stress can be very debilitating as well. Q. What Are the Possible Treatments for Osteoarthritis? My sister is suffering from osteoarthritis. 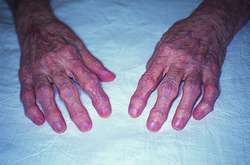 What are the possible treatments for this disease? My Mother has had osteoarthritis for about 20years. She has tried numerous things to allieviate the pain she has had. About three months ago, she started taking a natural product for inflammation. She still has osteoarthritis, but the pain has reduced so much that she is now able to do so many things she hasn't been able to do in a long time. She can now put pegs on the clothes line, turn light switches on/off, open bottles. I really feel for yourself and other who have osteoarthritis. I never really understood how debilitating it can be. I hope you tell people that you are in pain. I never knew my mother couldn't do all these things. Q. Can knee pain at childhood be connected to osteoarthritis? My mother is suffering from osteoarthritis (OA). She is 72 years old and the OA is a major problem in her life. My son is 10 years old. He has a relapsing knee pain. His pain occurs mostly at day time but can wake him from sleep. The pain is in both legs. Is my son in a risk group for OA? A. Osteoarthritis is a disease that is most commonly caused by weight gain. The problem is that weigh gain has an important genetic factor. So, it doesn't matter if your son has knee pain right now, he is in a risk group for OA. If your mom is fat, she can start a program to lower her fat rate. I used this program for me. In the beginning it was too hard so cut her some slack! Researchers and doctors are attempting to discover the correct portrayal of the osteoarthritis in recent years. It was seen that out of those who developed the disease within a year, more than 75 per cent had signs of osteoarthritis on radiographic images but no frequent knee pain at the start of the study. Logistic regression was used to examine the independent and combined influence of BMI and WC measures on knee osteoarthritis. The Osteoarthritis Initiative is funded by the National Institutes of Health, Merck Research Laboratories, Novartis, GlaxoSmithKline, and Pfizer. Once these have been identified, the research team will use a new type of 'gene editing' technology to remove the harmful genetic changes from cells in the joint responsible for producing weaker cartilage in people with osteoarthritis. Compared to volunteers with healthy levels, participants with low vitamin D levels had more than double the risk of their knee osteoarthritis worsening during the study. Female obese patients with Primary osteoarthritis of Knee and hand who are willing to reduce weight were included. Compelling evidence comes from research such as a cohort study of patients with symptomatic hip or knee osteoarthritis that found walking disability predicted a 30% increase in the risk of all-cause death and a 17% increase in the risk of cardiovascular events; among the subset with comorbid diabetes, walking disability and grip strength predicted the risk of hospitalization for diabetic complications (PLoS One 2014;9:e91286). The management of knee osteoarthritis includes a variety of treatment options to benefit the patients, including medication, life style modification, braces, physical therapy and surgeries including arthroscopy and arthroplasty. Some younger people get osteoarthritis from a joint injury, but osteoarthritis most often occurs in people over 40. Three of the 10 available fossils of Caudipteryx showed signs of osteoarthritis, the News Scientists reported. 13,14) In most but not all studies, the increased risk for osteoarthritis of the knee among overweight persons is stronger in women than men.